It seems to happen every year. In the days leading up to the Big Dance, conversations inevitably ensue about the weather, and most specifically, the heat. This year, the 10-day forecast and the general trend all seem to suggest that we are in for a hot one next Saturday. This could all change, of course, but it’s worth keeping in mind as the excitement continues to mount toward Race Day. The four hottest years on record, without a doubt, are 1981, 1995, 2006, and 2013. And, while there is generational difference of opinion on which one was the hottest, there is general agreement that 2006 takes the cake. That year had the perfect storm of race week course baking, a hot temperature even at the start in Squaw, and an even hotter Sunday. All that combined made it one of the lowest finishers rate years in the modern era as well as some of the slowest winning times. It was, in short, a bloodbath. And, all the finishers I know who made it to Placer High School that year, to this day, 10 years later, wear it as a badge of honor. Keep yourself wet all day. There are many creek and river crossings on the course. Be sure to get yourself wet in every one. Even if it feels like you don’t need to do it. The wetter you are, the better you are. And, as you are preparing your crew for the race consider setting them up with an ice bucket and sponge, it’ll make a world of difference. Wear an ice bandana. You’ve seen bandanas in the old race footage from years gone by and in hot years there is nothing better than ice hanging around your neck and cold water constantly dripping down your body. Sure, you may end up chafed by the end of the day, but it will be worth it because you’ll finish and stay cool all along the way. Throw your splits out the window. So many WS runners fail to achieve their goals because they get wedded to time, whether a winning time or a buckle time or simply a finish time. 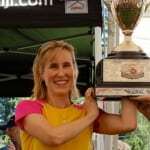 The thing is, Western States usually has other things on her mind and as such the most successful “hot year” runners ignore time and pay more attention to heart rate, nutrition, and self-care. There you have it folks, here’s hoping for a hot one! Those are always the best ones. This week’s Beer of the Week comes from Maine Beer Company. Their Zoe is a zesty amber ale that goes great with food. Since so many of us are in the throes of 100-mile training and eating heartily a beer that pairs well with food seems to be a great choice this week. What was your experience running a hot race at Western States… or any other race? I have a super hot and muggy 100 coming up in August (Eastern States). I have been thinking about how to stay cool. Do WS veterans just roll up a bandana with a few cubes of ice inside, and tie around the neck? I have been thinking about what methods will be best for staying cool. One time I saw a special bandana that had a pocket sewn in it for ice, but for the life of me I cannot locate it again. Thank you. It has the pocket you mentioned as well as a built-in chamois that’ll stay soaked for hours. These were indispensable while crewing my girlfriend at San Diego 100 a few weeks ago. In the same boat, just got word that my package of white bandanas has arrived and plan on working on my ice technique over the coming weeks. Eastern States will probably be a rough one this year. Personally, I don’t like that ice bandana; it bugs me too much because of its thickness and feels like it’s choking me. I love a regular fabric buff around my neck, which i intend to keep wet, and hopefully ice in bra and hydration vest (putting ice in the pouch of my back) will cool my core down, along with a wet hat. I just ran my first ultra with a heat index in the mid 90s… I bought the new Nathan Vapor Shadow Vest because of the new added ice pocket. The pocket allows you to stuff ice cubes the length of the pack and I stayed cool the entire race with the ice sitting on my back the whole race. BUT who’s gonna’ win Friday’s 6k uphill challenge??! !